Turning to the landmarks, at the center of Bruges is the Markt. This is a vast market square bordered by cafes and restaurants as well as some important public buildings. 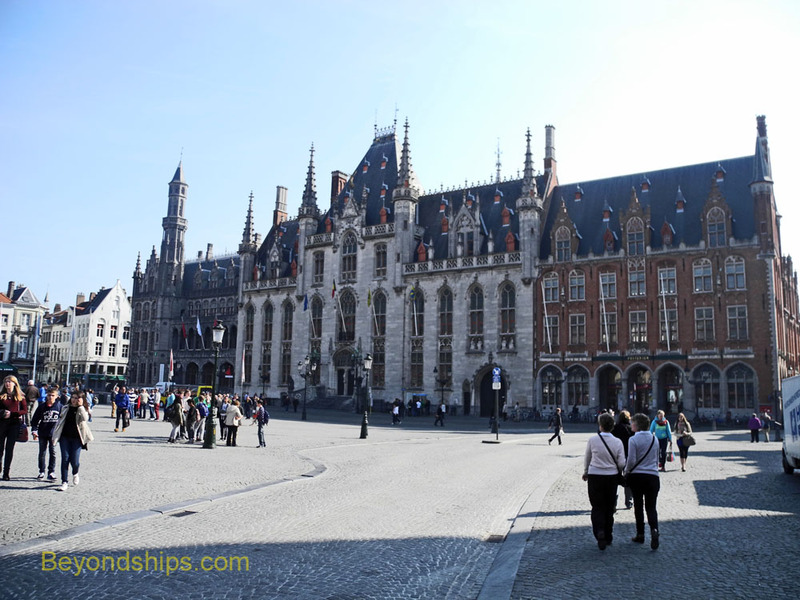 The statues in the middle of the square are of Jan Bredel and Pieter de Coninck, two of the leaders of the 1302 rebellion against the French occupation of Bruges. 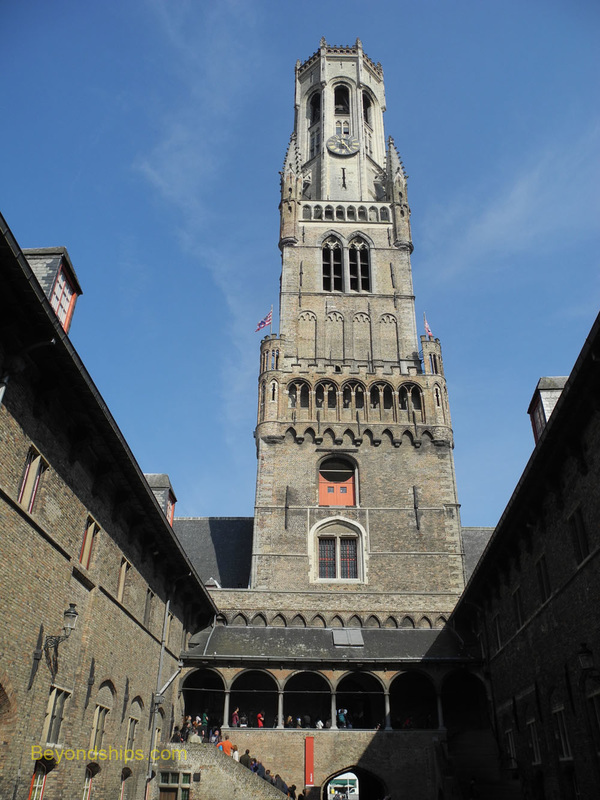 The most important landmark in the Markt is the Market Hall and Belfry. The Market Hall was built between the 13th and 16th centuries and was where much of the city's commerce was conducted when Bruges was important in the cloth trade. Atop the hall is a 272 foot tower completed in 1482. Its primary purpose was to act as a watchtower for fires and for enemies approaching the town but it also served as a treasure house. The tower houses 47 bells of various tones. These are still rung to announce the time as well as for daily concerts. Visitors can climb the 366 steps to the top of the tower for a panoramic view of Bruges and its surrounding area. On the east side of the square is the Provinciaal Hall. Built in 1887 in the Neogothic style, this was the seat of the district government. Nearby is another open square called the Burg with even older government buildings. At one time a fortress stood here built by Count Baldwin I to guard the town against Norman raiders. As a result, this area is sometimes called the “fortress” or the “castle” even though that structure has long since disappeared. The most prominent feature in the Burg is the Stadhuise or Town Hall, a Gothic building constructed between 1376 and 1420. The statues in the various niches in the front facade are of the Counts of Flanders who once ruled this area. 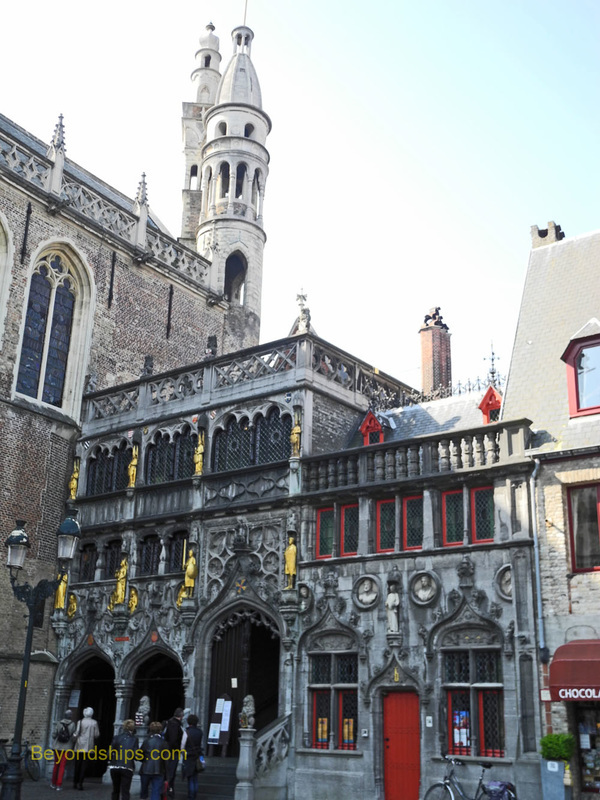 Next to the Town Hall is the Palace of the Liberty of Bruges. 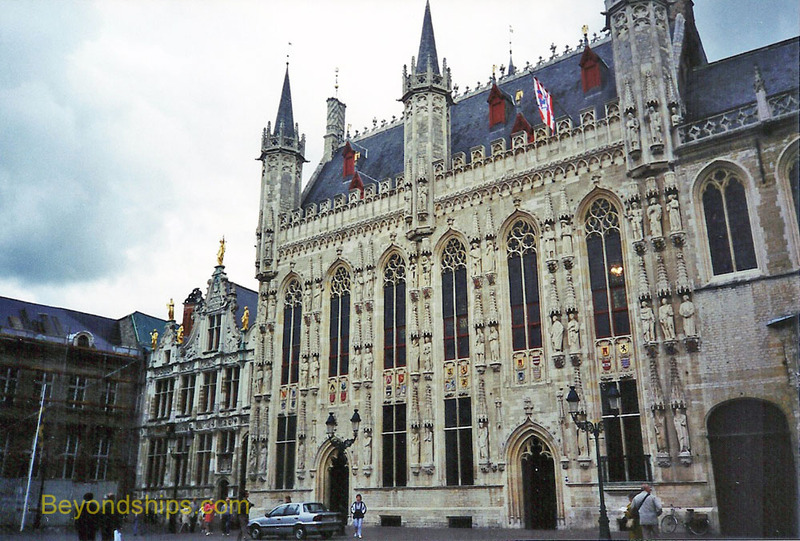 The Liberty was the name for the area surrounding Bruges and this was where this area was ruled from until 1745. The building then became a law court and continued to serve as such until 1995. Today, this 18th century Renaissance style building is the city archives and a museum. On the other side of the Town Hall is the Basilica of the Holy Blood. Upon returning from the Second Crusade, the Count of Flanders donated to the church a vial supposedly containing sheep wool that had been used to wipe blood off the body of Jesus. This relic, which is on display inside, gives this church its name. The 12th-century basilica consists of a lower Romanesque chapel and upper Gothic chapel. Also in the Burg is the Provost's House, a large white Baroque-style building that was once a bishop's residence. Above: The Belfry above the Market Hall. Above: The Basilica of the Holy Blood.